Laveen Horse and Carriage is relatively new to Laveen and South Phoenix in Arizona. Owner and operator, Joyce Oliphant started the business in 2009. Joyce, her horse 'Floozy' and her companion 'Sprout' will carry you through quiet rural streets along the northern borders of South Mountain Park, an ideal setting for romantic interludes with someone special, awesome mountain vistas, fantastic views of the city, picturesque sunsets, or the sheer joy of riding in an antique carriage. Carriage rides originate from Del Monte's Market (circa 1908) at the corner of 27th Avenue and West Dobbins Road or The T-Bone Steakhouse located at the end of 19th Avenue south of Dobbins Road nestled in the foothills. Joyce, Floozy, Sprout, and the antique carriage are available Friday and Saturday evenings during the fall, winter, and spring months. Through the summer months, Joyce operates by appointment only and is available for special outings such as weddings and other private engagements. 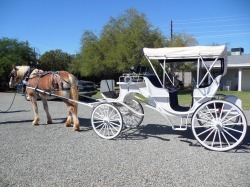 One only needs to call or have a look at Laveen Horse and Carriage for more information.